Hey, Cleveland! 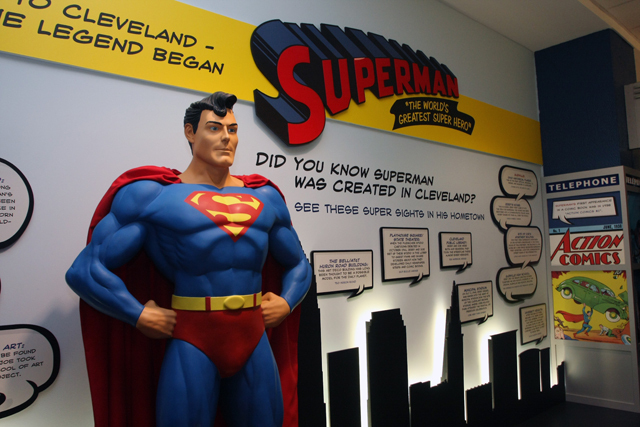 Did you know that Superman was created right here in Cleveland? That’s right, on April 18th, 1938 Superman first appeared on the cover of DC’s “Action Comics No. 1” Superman was the creation of local Cleveland residents Jerry Siegel and Joe Shuster. The pair created the Man of Steel during the Great Depression in a Glenville neighborhood home. Starting this week, and leading up to his 75th anniversary on April 18th, we are asking you to send us your best Superman photos! We want to see your best superman poses, costumes, collections, or whatever you may have! Be creative! We will post the photos on our social media sites and put together a final album and post it to our website! This special event will culminate with Mayor Jackson declaring “Superman Day” in the City of Cleveland on April 18th. So join in with us to help celebrate the 75th anniversary of Superman and help us fight the never-ending battle for truth, justice, and the American way! Disclaimer: All submissions must be appropriate for all audiences. See our “Policy” tab for further direction. Let’s all join in the celebration! Celebrating the superhero who sought justice – that’s a good thing.